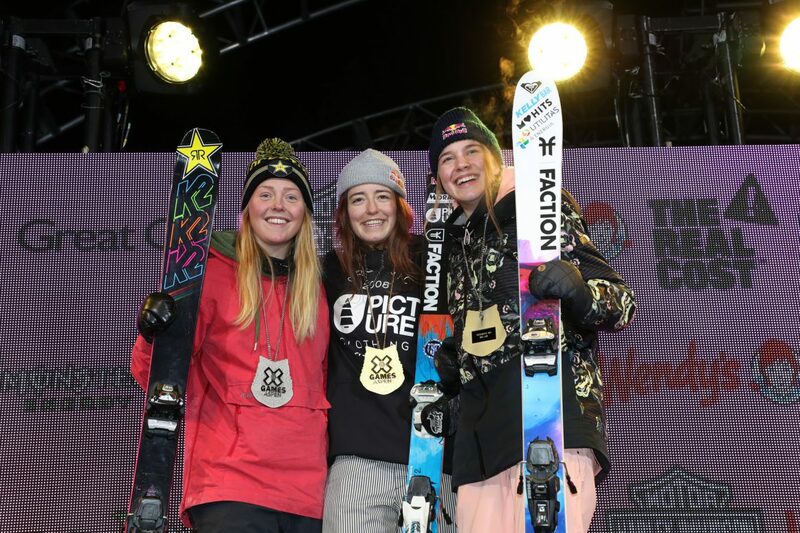 Swiss skier Mathilde Gremaud took home the win at last night’s X Games Women’s Big Air ahead of Norway’s Johanne Killi and Estonia’s Kelly Sildaru. In a 25-minute jam session during which competitors sought to land their best left- and right-spinning tricks, Gremaud prevailed with a right rodeo 900 japan and a left switch double cork 1080 safety. Nipping at her heels was Killi, who relied on a cork 900 tail for her leftside trick, and landed the night’s highest score of 48 with a switch right double cork 10 japan on her last jump to slide into second place. Meanwhile Sildaru, who’s already taken a silver medal in superpipe and gold in slopestyle at this year’s X Games, added a bronze medal to the list with matching left and right switch 12 mutes. The podium could have gone several ways in this equally matched contest, with almost all the ladies in serious contention relying on some variation of a 900 in their unnatural direction, and a double cork to their natural side. American Maggie Voisin was on the medal hunt with a big leftside double cork 1260 safety, but had trouble on the landing and took all of her five jumps to stomp it clean, leaving her without a rightside trick. Tess Ledeux of France also came packing a double cork 12 mute and was able to step up her rightside trick to a rodeo 9 safety, good enough for fourth place. And last year’s gold medalist Sarah Hoefflin landed a switch double-wobblish 1080 mute to the right and was looking for a matching switch double to the left, but couldn’t get it to her feet. There’s no doubt the world of women’s Big Air skiing has taken huge strides forward. Last year was the breakthrough “women got dubs!” moment, with several different competitors putting down double corks for the first time. Now in 2019, it’s already a given that all of the top girls will have at least one double cork in their trick bag. As the level of skill continues to rise in a field of nearly equally-matched competitors, the ladies’ Big Air events will definitely continue to be a great show to watch. The women’s freeskiing contests are now a wrap at the 2019 Winter X Games, with a hard-fought victory for Cassie Sharpe in halfpipe and an historic appearance for Kelly Sildaru, who medaled in three different disciplines to extend her lead as the most decorated teenage X Games contestant. There are still two big freeski events to go at the X Games: the Men’s Ski Big Air finals at 8:00PM MST tonight (4:00AM CET), and Men’s Ski Slopestyle Finals on Sunday at 12:00PM MST (8:00PM CET). Find out how to watch and get a full recap from the other X Games events with our X Games Viewer’s Guide.